I lift the blinds on the back door and there he is. Every morning, the garden birds arrive for breakfast but while other birds wait in the pine trees or gather on the fence, this fledgling has been sitting between the flower pots. As I open the door, he hurries forward to be first in line for the soaked mealworms I sprinkle on the patio, then under the table where he will be safe. 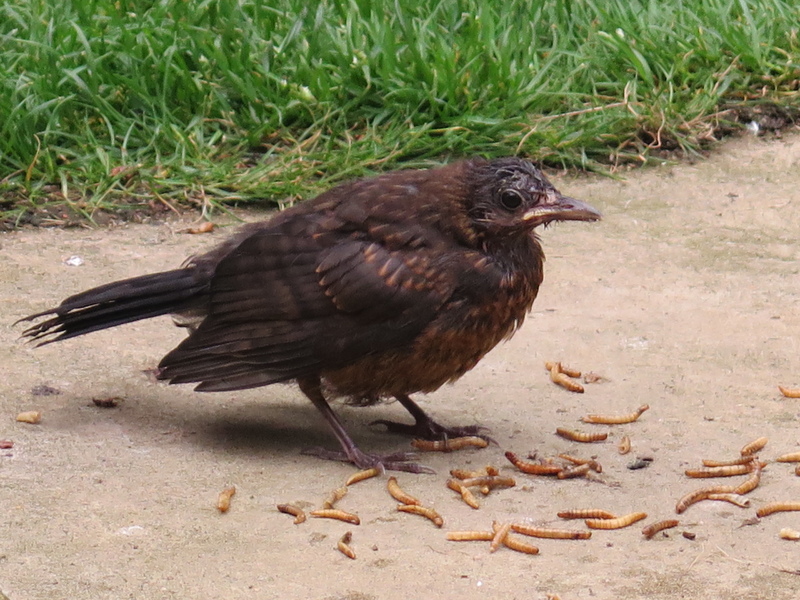 I have grown fond of this blackbird fledgling, although I know he is quite poorly. He can no longer fly like his sibling. I noticed them in early May – the first of the season’s blackbird fledglings in our small garden. I had been out to top up the feeders and water dishes like I do every morning before eating my own breakfast and watching birds come and go – blackbirds, pigeons, doves, bluetits, greenfinches, the usual regulars. I noticed a female blackbird fly to the base of the laurel tree met by two fluffy chicks, beaks wide open. I have let low branches sprout from the laurel for this very purpose – a safe haven for fledglings. Such joy! Through my binoculars, I watched the female fly back and forth to her chicks with their stubby tails and flapping wings. But with the joy comes anxiety. Away from the relative safety of their nest, the chicks are vulnerable on the ground for five days or so while they learn to fly. I would need to keep watch for my neighbour’s cat, which sometimes stalks along the fence. 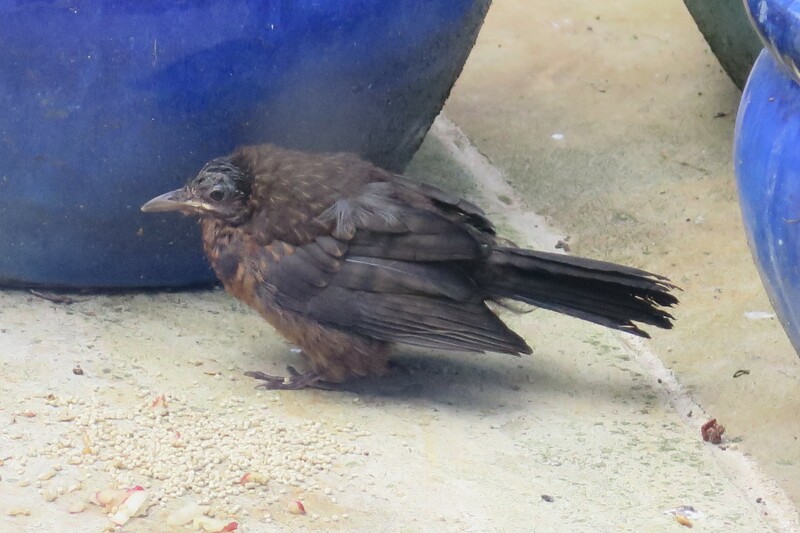 A couple of days after first seeing the chicks on the ground, a fledgling hit our kitchen window, fell onto the patio, and spun around on its back. It had to be one of the new chicks. The other pair of fledglings in our garden were older and could fly quite well. They didn’t fledge in our garden – I had watched their parents take food elsewhere. The dazed fledgling seemed unable to walk properly and kept falling over. I put him in a box on the grass to give him a safe place to recover but he soon came out. For three hours, I watched and worried he wasn’t eating or drinking – his mother had only fed him once even though she was feeding his sibling nearby. He seemed to recover and flew up to the wooden fence. I was delighted. 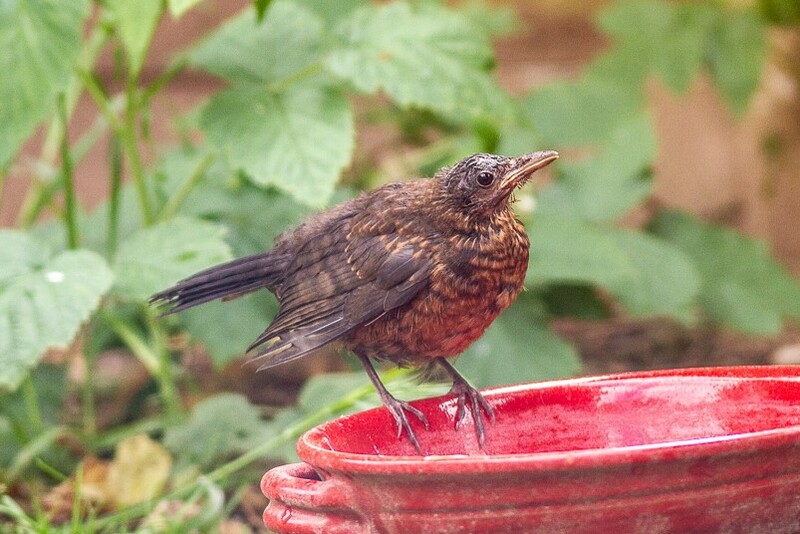 Two weeks later, we notice a blackbird fledgling with a damp head. His head seems tiny compared to his body and his breathing is a little laboured. Other birds fly away if I tap on the window or open the door to go out, but he doesn’t move. I know it’s the bird that flew into the window because I see him with his mother and sibling. Over the next week, I watch helplessly as his head gets wetter and his body weaker. Flying takes so much effort but he isn’t giving up. The survival instinct is strong. He is waiting by the back door when I open the blinds. His feathers are fluffed up, his wings drooping. His chest moves quickly as he breathes. On other days he has defended his mealworms, but today he hides until the other birds have gone. Some birds home in on weak individuals of their own species. Blackbirds seem to do this, and he is attacked several times today. I bang on the window to scare off the tormentors. He is still preening and digging in the grass looking for insects like blackbirds do. I haven’t seen him fly up to the fence, but he sits on the leg struts of the wooden chair by the table. When he has the garden to himself, he even sits on the seat. At night, I think he sleeps in the pine tree, in the lower branches where the trunk is covered in ivy. At 8.30 am, he is waiting again. I am feeding him grated apple now because I notice he can no longer peck flesh from the halves I put out. I’m also giving him Harrisons, our pet bird’s food because it’s nutritious and the pieces are tiny. He has stopped eating the soaked mealworms and suet, which I hoped would be soft and easy to eat. He seems hungry but cannot pick food up in his beak today. 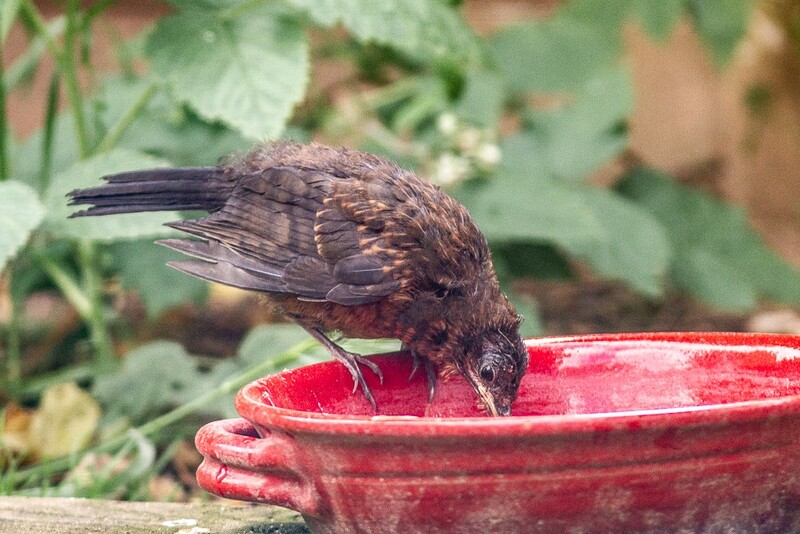 He still drinks from the water dishes placed on the railway sleeper along the flower bed. We go out for the day today. When we get back, the birds are roosting in the trees, but the poorly fledgling is on the patio. I put out some grated apple, which he eats. He tries to fly onto the chair by the birdbath in an attempt to reach the fence by the ivy-covered tree, but he can’t get the height. He tries several times. I feel desperate as I watch him. He hops behind the shed a couple of times but reappears. It’s almost dark and he is looking for somewhere safe to roost. My husband puts the chair close to the tree and places another on top, folded flat to create a slope to the fence. The youngster seems to know what to do and flies onto the seat but slips off when he tries to reach the sloping chair. We try just one chair – he makes it to the chair back but falls to the floor when he tries to fly to the fence. He gives up and heads for the long grass close by. It is dark now. I think about him as I lay awake. He is no longer fighting off the other blackbirds. He eats so little and is weaker each day. I stand guard when he is feeding, but I can’t watch all day. I look up wild bird diseases that match his symptoms. I think it could be trichomoniasis, or canker, which is common in pigeons and doves and more recently in greenfinches and chaffinches. Canker can be passed on by parents regurgitating food to feed their young, or spread through saliva or faeces on feeders and fruit and in water dishes and birdbaths. I learn that trichomoniasis is a bacterial infection in the upper digestive tract, the crop and mouth, which is fatal in wild birds. Captive birds can be treated with antibiotics and liver support medication, but it isn’t practical for wild birds it seems. This isn’t what I want to hear, neither the cause nor the prognosis. I think about the apple halves I place on the grass, which may get soiled with faeces when birds peck and move them around. As well as mealworms, I have been putting seeds in the ground feeders for the blackbirds, but this has attracted more pigeons and doves. Birds wipe their beaks on branches, chair backs and the fence top too. I worry that the window incident might not be the whole story for this poorly fledgling. Feeding garden birds helps them of course, especially in winter when food is scarce and in spring when they have young to feed. But having too many birds in one place can be a breeding ground for disease. I could be killing the birds I am trying to help. We brush and clean the patio with a weak bleach solution then hose it down with clean water. The poorly fledgling watches from the flower bed. As soon as we put the chairs and pots back, he returns to his favourite spot on the chair leg strut. The poorly fledgling spent the night in the long grass again but he is by the kitchen door at 8.15 am. He eats some grated apple and Harrisons then hides between the flower pots until other birds have left. He eats a little more at midday. We are out for several hours again, but he comes to the door on our return. I feed him, then he looks for a roost. I move the chair to the flower bed and he climbs up to the seat via the leg strut but doesn’t attempt to fly. Giving up, he hops back and forth around the garden. I stop watching at 8 pm. It is misty tonight and I can’t bear to think about him suffering. I had seen a bird suffer in our garden last year. In late summer, I noticed wood pigeons attacking another pigeon, which was unusual. They tend to beat their wings and stand tall but I hadn’t seen pigeons so aggressive before. Through my binoculars, I saw the victim’s crop was enlarged and his beak open. The bird couldn’t fly, so I was able to shepherd him into a cardboard box to take him to the vet. They called later to say he had advanced canker and they would put him to sleep when they had a break in their schedule. I wondered if being kept in a box in an alien environment all day would have caused more suffering than letting nature take its course. I felt I had abandoned that wood pigeon. This time, I would do what I could and leave this blackbird in his own environment. 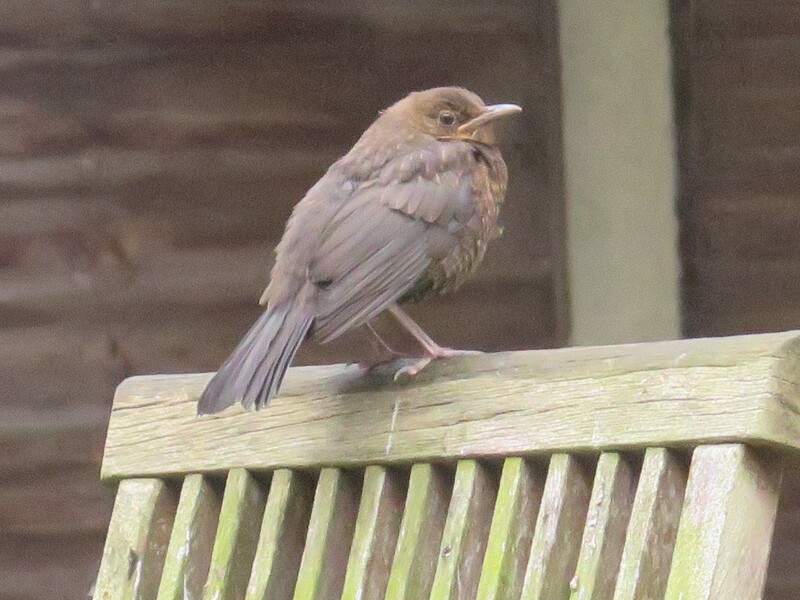 The poorly blackbird fledgling rushes to the door as I open the blind. I am so relieved to see him. It is a good day already. I put out grated apple and Harrisons but an older fledgling pecks at him, so I put the food between the pots where he can eat in peace. I see him through the day, sleeping by the fence near the shed and looking for food in the long grass where he seems to catch something. Sitting on the chair under the table, his wings don’t look so droopy. He drinks from the dish in the safe place under the table. He moves quickly around the garden today and I feel hopeful, but then, for the first time, I see him struggle to hop up to the flower bed. At dusk, after eating some grated apple, he doesn’t search the garden but goes straight to last night’s sleeping spot in the long grass. It is so quiet tonight, so peaceful. All the other birds are roosting. It seems colder too. When I open the blind, I know. The feisty fledgling isn’t waiting between the flower pots. He isn’t running across the patio as I open the door. I go over to the long grass and there he is – lying on his side against the fence, eyes open but unseeing. Nature seems cruel. Not long ago, his mother was nurturing him. A short life and lonely death. I’m sad to see him gone but I’m relieved he is no longer suffering. He was beautiful. 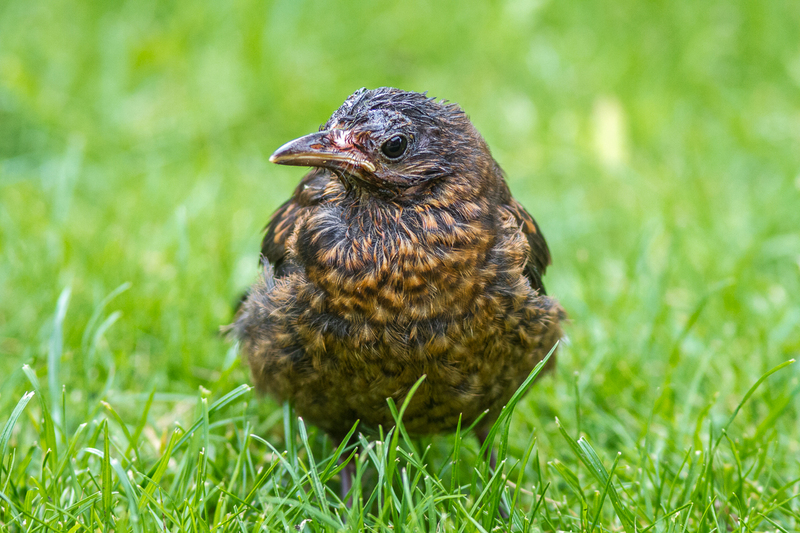 Image credit: David Brighten who recorded the short life of this beautiful young blackbird. Thank you.